I have problems with anxiety disorder, have done for years, and last year got bad enough to go on anti depressants. Sometimes panic attacks are triggered by nothing particular, but high pressure situations are often tricky. E.g. last month I went to the theatre and in the interval I had my worst panic attack in 6 years. So I never expected to get through a week in a new country, new continent, new food, new people, new all sorts – it was going to be difficult. I thought that even if I managed to remain in control all week I’d at least be fighting it and it’d be hard work. I was fine ALL WEEK. Other than a slight issue with breakfast on the first day which didn’t even feel that anxiety like, I didn’t even feel a slight hint of it. I had many friends and colleagues praying for me over the week and God massively exceeded my expectations!!! Uganda is an amazing place, but one thing of many that was so different to the UK was the pattern of so many shops that had Christian names! There were also some pretty good general ones too. Here’s some of the ones I spotted from the bus window! In the UK you tend to get 7/11s, not in Uganda! This morning I was given 5 minutes at Romsey Baptist Church where I grew up, to share briefly about my trip, so it seemed sensible to share it too to give you a high level overview, just incase you’re not interested in all the stories as they come out! 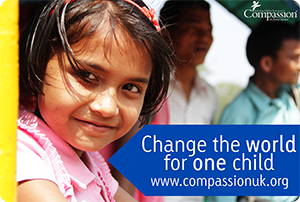 For the last 4 years have been working in the IT team at Compassion UK doing all things data – and it’s fun! They are based in Weybridge in Surrey, but this time last week I was privileged to be in the beautiful country of Uganda! I joined a group of American sponsors and their tour leaders and spent a week in “The Pearl of Africa”, where they would meet their sponsored children. We stayed in Kampala, which is just on the edge of Lake Victoria, and is the capital city. Our first full day there we visited a one of the many projects in the country. We got off the buses down the road from the project and could just hear screams as if One Direction had arrived! We were greeted by some of the girls who did a dance, and then by hoards of beautiful children! We had some time in church with them where we heard more about what goes on there. This particular project ran both the Child Development through Sponsorship Program (CDSP), but also the Child Survival Program (CSP) which is where babies and their caregivers, and also pregnant mums, are supported. They are cared for, fed, taught how to look after themselves and their children well and also taught income generating skills such as woodwork for the men, and jewellery making, hair braiding, weaving, sewing, and other crafts, for the women. On the Thursday we went to visit the Compassion Uganda office in Kampala. We saw the piles of letters from children ready to be checked through before going on to sponsors, and all the pigeon holes where all the check letters from sponsors are put ready to be delivered to the projects. We shared devotional time with the staff and I also got to meet their head of IT! We spent three days with Leadership Development Program (LDP) Students. These are young men and women who have been sponsored as children, completed the program, excelled academically and shown leadership potential. These outstanding students are then sponsored through their university course (at a higher monthly rate of course!) while simultaneously studying on the leadership course, to become exceptional leaders within their professions. We were invited to attend this years graduation ceremony on the Friday, and spent the preceding two afternoon sessions with them, leading seminars, and participating in a ceremony in which we washed their feet and prayed with them. It was also a time where we got to experience the incredible joy of African worship! I have some great videos of this! Saturday was the day the American sponsors had been waiting for! The children came from all corners of the country, accompanied by their project workers, and all gathered in Kampala. We went to a small amusement park in the city and each sponsor met their child, some for the first time, some had met once before. We took them in and while some enjoyed the rides a little less than others (they most likely wouldn’t have experienced anything like it before! ), at the end of the day, when sponsors and children exchanged gifts and prayed together, you could see how much the whole day had meant to them. This was the group of all sponsors, children, and the project staff that had brought the children for the day, I think we totalled about 84 people! The last day we visited Deliverance Church and very briefly had a quick look around the Compassion Project office there and met the project director who was a formerly sponsored LDP student! Then there was just time for a quick stop off at the market before our flight back. The whole experience really was mind blowing. We met some of the most inspirational people, covering all ages, but it was really special to meet these graduating students who are the future of that country. I was chatting to one girl who told me she wants to be a reverend and then go on to be an MP. And while that may sound farfetched, it’s already happened once. A lady called Margaret graduated from the Uganda LDP Compassion program and in May 2011 was elected as a Member of Parliament. When we were there they talked about how one day, a formerly sponsored child will lead their country. What a day that will be! This trip was a little different to the normal tours because we had such a focus on the LDP students, but because of this we didn’t really see the poverty in Uganda, we saw the difference and success of Compassion in the lives of those who were once in poverty! I know most of us wouldn’t be able to afford to sponsor one of these students, but every single one of them started out as a child in poverty that needed a sponsor, just like the ones available now for sponsorship. Things have been a little quiet around here lately, sorry! This time last week I was in Uganda! I had an amazing week in Kampala seeing the work of Compassion UK on the ground. “3 We always thank God, the Father of our Lord Jesus Christ, when we pray for you, 4 because we have heard of your faith in Christ Jesus and of the love you have for all God’s people – 5 the faith and love that spring from the hope stored up for you in heaven and about which you have already heard in the true message of the gospel 6 that has come to you. In the same way, the gospel is bearing fruit and growing throughout the whole world – just as it has been doing among you since the day you heard it and truly understood God’s grace. 7 You learned it from Epaphras, our dear fellow servant, who is a faithful minister of Christ on our behalf, 8 and who also told us of your love in the Spirit. Wow. There’s some big stuff in there! We’d good at praying for people when they’re going through hardships, but when things are going well or routinely, we tend to neglect them in our prayers. We need prayer as much when things are routine as when there’s trouble. But what do we pray for the routine times? Try out verse 10! We can’t improve on Paul’s prayers, take 2 or 3 names a day from the church directory (or some other list of people you know) and use Ephesians 1, Ephesians 4, and Colossians 1 and put their names in! Otherwise we end up as just prayer chain pray-ers, what about everyone else? They still need to grown in the love and knowledge of God. “His letters contain some things that are hard to understand” – 2 Peter 3v16, Even Peter admits some of Paul’s writing is difficult! When you know someone well, you get to know how they would think and act in a given situation à la Mr & Mrs. If you think WWJD, you’re only going to know the answer if we’re close to Him and walking with Him. We may want to know who to marry, but He’s more interested in us being a good husband or wife. When you count your blessing you can’t stay grumpy for too long! If you’re struggling to realise your blessings, try reading Ephesians 1. We’re not called to pretend that bad things that happen are good, but we shouldn’t lose perspective. We should remember that God is Good. We can joyfully give thanks no matter what because of what Christ has done for us. You can’t stay grumpy for long knowing that Christ died on the cross on our behalf so that we can be right with God and spend eternity with Him. If our greatest need was a economy or entertainment, God would have sent an economist or Ant & Dec (wait a minute?! ), but He sent us a Saviour. When we pray for others, we can pray through all the bullet points above!